IIT Patna Recruitment 2019 - JRF Post on a project entitled " Cyber-Physical Systems for M-Health. " in IIT Patna, Patna, Bihar on Temporary Basis. Candidates are invited by Indian Institute of Technology, Patna to attend walk-in-interview to be held on 01 Mar 2019 02:00 PM for 1 vacancy.
" Cyber-Physical Systems for M-Health. " Science & Engg. Research Board (SERB), Govt. of India 4. Eligible candidates may appear for interview along with duly filled application form in prescribed format and self-attested copies all supporting documents and original documents for verification. Venue Room 129, EE department classroom, Block 3, IIT Patna, Bihta, Bihar. 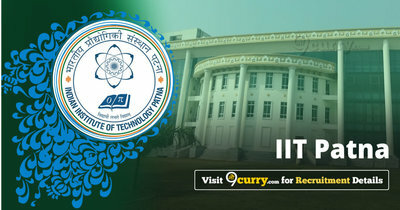 IIT Patna Recruitment 2019 - Walk in for JRF Post on a project entitled "Seismic Design and Performance Verification of Confined Masonry Walls for Medium-Rise Buildings" in Dept. of Civil and Environmental Engineering, IIT Patna, Bihar on Temporary Basis. Candidates are invited by Indian Institute of Technology, Patna to attend walk-in-interview to be held on 29 Apr 2019 02:00 PM for 1 vacancy. IIT Patna Recruitment 2019 - Walk in for JRF Post on a project entitled " Towards New Platform on Generalized Vector Variational Inequalities: Scope in Optimization and Bilevel Programming" in Department office Electrical Engineering, IIT Patna, Bihar on Temporary Basis. Candidates are invited by Indian Institute of Technology, Patna to attend walk-in-interview to be held on 25 Apr 2019 11:00 AM for 1 vacancy.